Change is frequently a difficult experience for many people, no matter how necessary or worthwhile they believe it to be. This is certainly proving to be the case with the future of the U.S. Postal Service, one of our most visible, and treasured, American government institutions. The need for change is well documented and easily recognized. The Postal Service announced a $5 billion operating deficit last year, raising its total, cumulative losses to over $62 billion since 2007. This vast burden amounts to roughly $250 for every American adult, with no solution in sight. Absent the right details, granting the Postal Service the increased flexibility for pricing its leaders have sought from Congress could escalate these losses. A major reason for the Postal Service’s predicament is obvious: the volume of first class letter mail, long the agency’s most profitable product, has been in rapid decline for the past decade. More than nine out of ten pieces of mail are sent by non-households. The role the agency plays in our daily lives is changing as the contents of the mail it delivers has changed. Postal Service operations are predominantly funded by the products and services it sells, and taxpayer-funded appropriations are minimal. For most people, the notion of paying 49 cents to mail a letter anywhere in the United States in just a few days would seem to represent quite a bargain. But in truth, Postal Service leaders have long acknowledged that this transaction is a profitable one for the agency — so profitable, in fact, that a pattern of using it to subsidize the agency’s other business lines, especially those in competitive markets has also become evident. Although such subsidies are explicitly prohibited under federal postal law, the agency’s use of an arcane costing system allows the practices to persist. Postal Service accounting permits approximately 40 percent of its operating expenses to be lumped together as institutional overhead, not attributed to any specific products or services. Such a system could never have persisted this long among the commercial leaders in the fast-paced express delivery sector. 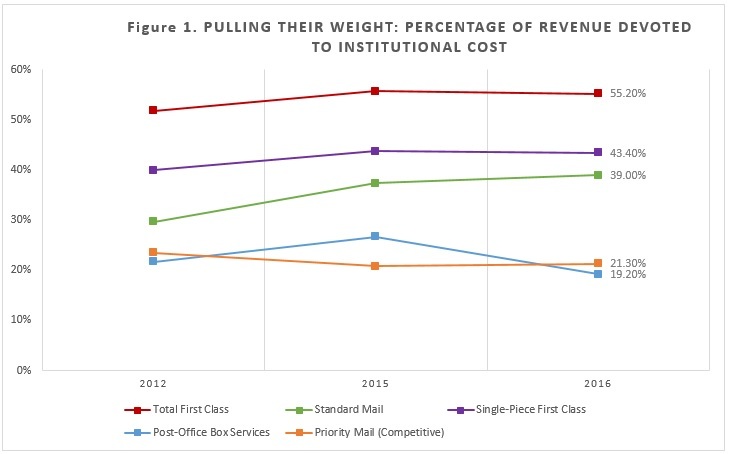 It allows postal executives, with the blessing of their regulators, to require customers of first-class letters and other monopoly products to spend twice as much of their revenue for institutional overhead as competitive products like priority mail packages (see Figure 1). 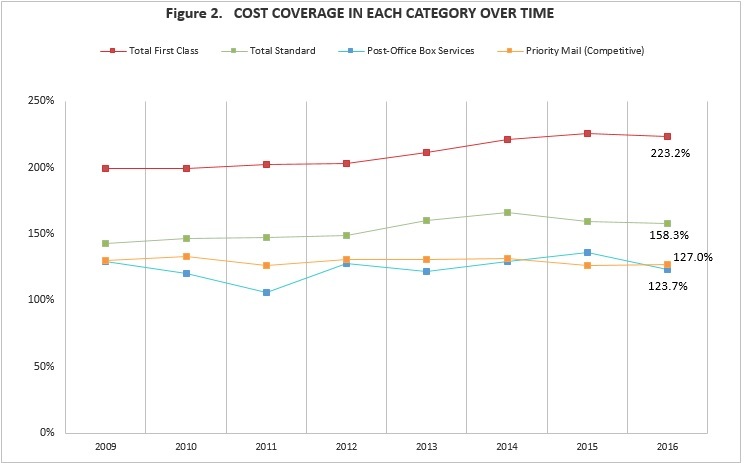 As a result, first-class mail covered 223 percent of its attributable costs in 2016, while priority mail covered just 127 percent of its attributable costs (see Figure 2). As economist Gregory Sidak has noted, the agency’s regulator, the Postal Regulatory Commission, has endorsed the agency’s practice of requiring customers of market-dominant products to pay 94.5 percent of institutional overhead costs since 2013. It is not unique for a government provider of a legally-protected monopoly like the Postal Service to also conduct business in competitive markets alongside commercial operators. Such examples could be found in twentieth-century America in the telecommunications and electric utility sectors. But they must be accompanied by effective and transparent regulatory regimes to protect the public from monopoly abuses and unfair market distortions. Postal Service leadership continues to aggressively assert its belief that express package delivery, driven by e-commerce, represents a path to return to a financially viable business model. Chances are, every television commercial or print advertisement you’ve seen for the Postal Service has promoted Priority Mail, its flagship competitive product. As a result, the share of its overall revenue coming from competitive products is also increasing, growing from by 22.6 percent between FY 2014 and FY 2016. Postal Service revenue from all market-dominant products declined by one percent over the same period as letter mail volume dropped (see Figure 3). Until consumers can be confident that its costing and pricing systems are treating them fairly, such strategies will likely make matters worse. For example, as Postal Service management moves forward with its plan to replace its aging fleet of some 180,000 delivery vehicles with a new model designed to handle more packages, at a projected cost around $6 billion, the potential for new market distortions subsidized by monopoly customers increases. Who will be required to pay for the new fleet amid such stark deficits and declining letter-mail volume is an important question to both Postal Service customers and taxpayers as well. A white paper published by the Postal Service’s Office of Inspector General in 2014 observed that, “A modern, bottom-up costing system would enable Postal Service executives to have a common and accepted view of costs and profitability.” The costs of implementing such a system, which most national postal operators in industrialized nations already have in place, would represent a major investment, but quite possibly a necessary one. It is also necessary to consider that the Postal Service has largely ignored the requirement Congress placed in federal law that it fund looming healthcare benefits for its retirees. Since 2006, it has made just $17.9 billion, and ignored over $60 billion, in required prefunding payments. The Government Accountability Office last year estimated the agency’s total liability for retiree health benefits to be $105.2 billion, more than half of which it determined to be unfunded. The trust and esteem many Americans have developed for the Postal Service over its history understandably make it attractive for federal policymakers to seek ways to preserve it. But as its business model has become increasingly untenable, the costs of doing so have grown rapidly, as have the implications for taxpayers. This entry was posted in Logistics, Postal. Bookmark the permalink.